Here are two links that are essential reading for anyone tempted to invoke the term "cyberwar" to describe the hacking of Sony Pictures and its subsequent canceling of The Interview. Book: The Tallinn Manual on the International Law Applicable to Cyber Warfare. This is the primer on the subject. Readable online at no charge. Article: Cyberwar: reality or a weapon of mass distraction. Very readable paper by my friend and boss, security expert Andrew Lee (.pdf file). Hopefully, politicians and commentators talking about the Sony Pictures hack will familiarize themselves with the facts and arguments laid out in the above publications before crying War! I have great respect for your work sir, on film and off; I have a feeling we hold many of the same views on politics and economics and social justice. So it makes me sad to see how badly people have briefed you on the stark realities of cybersecurity. You seem to be under the impression that America can, with impunity, tell cyber criminals to "bring it on". You appear to be having difficulty understanding why big companies don't want to provoke hackers. Please allow me to explain. In my own work I have seen the way in which multinational companies generate billions of dollars in profits by applying digital technology to improve productivity. My job has been, for the better part of two decades, advising companies on how to defend this highly profitable digital technology that they deploy. Sadly, time and again, too many times to count, my fellow security professionals and I run into companies and company executives who reject our advice as too costly to implement, as an unreasonable burden on their business. When we say that the path they are taking comes with a large amount of risk, they either don't believe us or they say, "fine, we'll risk it." Graph these over time and you can see C = the pain of cybercrime. 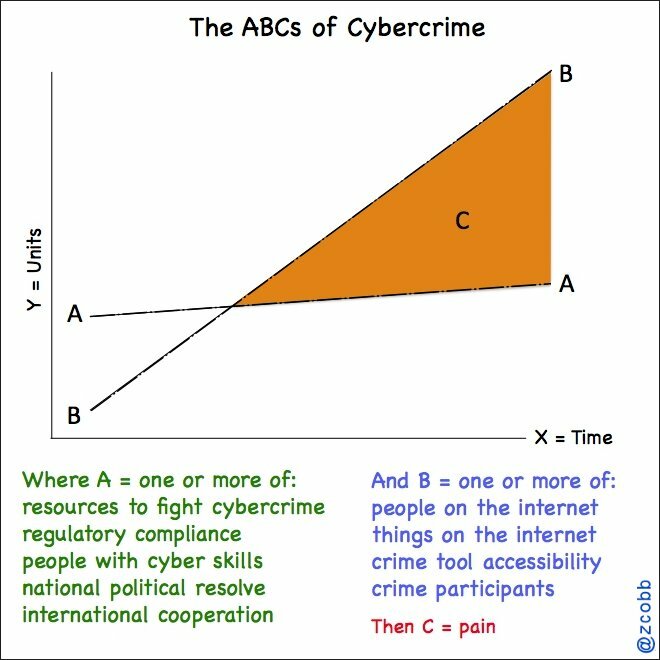 The more we can increase the upward angle of A, while reducing the upward angle of B, the less cybercrime we will experience. Just to be clear, globally speaking, C is a net negative. Cybercrime can be positive for criminals and their immediate economic environs, such as communities with limited options for legal employment of a gainful nature. However, C undermines the primary factors by which the upward angle of A can be increased: economic prosperity and political stability. Is this your Sample Information Security Policy? Every organization needs an Information Security Policy (although they may call it something different). When used appropriately the organization's whole approach to security will be guided by the policy document, a copy of which may well be requested during discussions around mergers, partnerships, and bids for new business. I have discussed the role and importance of security policy in several webinars, including this one directed at small and medium sized businesses. Last month I tweeted a picture of some computer code that was part of an Internet voting system. That picture was re-tweeted so many times it reached more than 220,000 Twitter users. So, that had to be some pretty amazing code, right? Yes, as in amazingly frightening. Take a look, and then read on for a short explanation, and also a long one if you have the time. 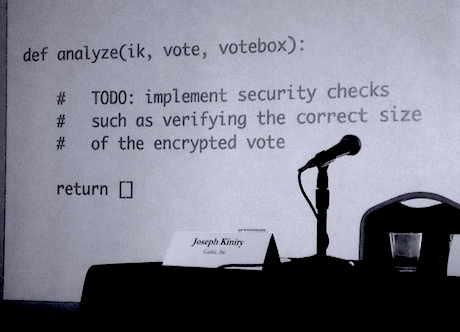 A very clever computer scientist, Joe Kiniry, has been concerned about the security of Internet voting applications for some time. Joe is a former Technical University of Denmark professor, now Principal Investigator at Galois. In his research Joe noted this section of code in a program that was actually used for national elections in a European country. The coder(s) have included a comment reminding themselves that security checks still need to be coded. My tweet suggested that this slide nicely illustrated the question of “what could possibly go wrong?” when it comes to Internet voting. Of course, the best answer to that question is: So much could go wrong you simply cannot use the Internet to elect public officials in a fair, honest, secret ballot! "Our dependence on technology is growing faster than our ability to secure it....Issues of public safety and public concern require public discussion and public solutions...We are going to be the ambassadors of technical literacy." My committment to my ambassadorial duties is my New Year resolution. Let the educational outreach begin. My prediction that data privacy is going to be a hot topic in 2014 was not surprising, but I am surprised at how many interview requests I've had so far, and we're barely halfway through January. Yesterday I found myself filling a last minute request to appear on a local TV channel. So I dusted off the trusty privacy meter. The idea is to ask people to self-assess where they fit on a scale from closed book to open book. They do not need to reveal their "privacy reading" but they do need to think about whether or not it is fair to impose their position on others. In other words, there is no correct reading, but plenty of scope to use the meter as a basis for discussion. For example, suppose you are an open book. Is it fair to make others become open book about their personal data if they prefer to be more of a closed book? On the other hand, if you think you are a closed book, are you prepared to provide information about yourself in order to authenticate your identity and establish trust? With the number of potential victims of the Target data breach now topping 100 million, a lot of people who have never really given much thought to cyber crimes are asking: Why? How is it that criminals can commit computer crime on this scale with apparent impunity? After all, we pay taxes to be protected from the kind of scum that perpetrate crimes like this. Despite all the hot air from politicians over the last 15 years, repeatedly pledging to do something about computer crime, the U.S. has failed to make fighting cyber crime a priority. I think these relative spending numbers make that clear. I would love to hear anyone argue that we are spending enough money to track down and prosecute cyber criminals right now. An academic study published in 2012 put the total U.S. law enforcement spend on the fight against cyber crime at $200 million per year. I decided to be generous in my chart and rounded it up to $250 million. The figure of $15 billion is often cited as the annual cost of the war on drugs, so apparently that is 60X more important than cyber crime. We know from the Snowden revelations that spy agencies spend over $52 billion per year, so apparently we think that what they do is 200X more important than fighting cyber crime. 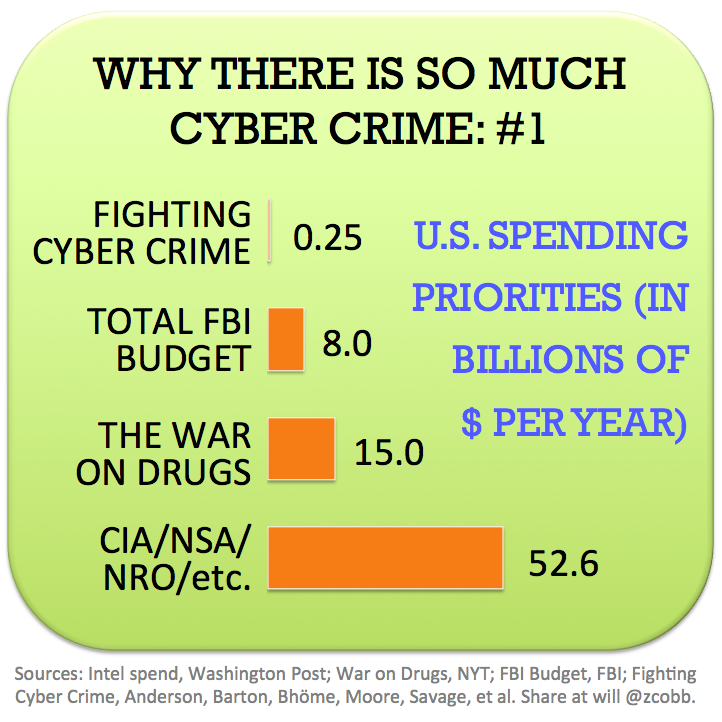 How about we shave $0.5 billion off the intelligence agency budgets and spend it on bringing cyber criminals to justice? That's a 3X increase over what we spend right now. That might well be enough to put a significant number of perpetrators behind bars, including the ones we could afford to bring to the U.S. from other countries, thereby tipping the risk/reward equation against the bad guys and in the favor of honest citizens. I'm writing to my representatives in Washington to tell them what I think our priorities should be. I'm sending them this chart. If you agree, I invite you to send it to the folks who are supposed to be representing you. As we enter 2014 it is clear that two events in 2013 have rocketed data privacy and information security to the highest level of public awareness that these the complex topics have ever attained. 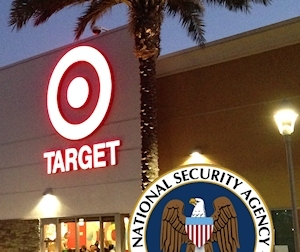 I'm talking about the Snowden revelations and the Target breach. For me, this surge in public awareness of the importance of data privacy and cybersecurity is both exciting and frightening.Why? Because 2014 is obviously going to be a big year for those of us who work in these closely intertwined fields, a year when more people than ever before will be concerned about securing their data, yet more distrustful than ever of the folks who are trying to help them do that (among whom I count myself). Consider that I have spent the better part of 20 years writing and speaking about these issues, starting with computer security, then network security, system security, information assurance, data privacy, and now "cybersecurity." You could say that I have wanted nothing more than to make the world aware of the importance of these things, for the simple reason that, without such awareness, the true potential of digital technology will never be realized. Let me put it a different way: Are you wondering where the flying cars are? Are you disappointed that in 2014 we don't yet have them, or transoceanic high speed rail service, or the handheld medical scanner that can diagnose the top 100 medical conditions in a single swipe? I believe we would have achieved these or similar technological marvels by now if it were not for the massive distraction of information insecurity. I don't want to wander off into too many examples, but consider one: Towards the end of the last century email was poised to become a universal tool for managing transactions cheaply and easily. Then came the spam-plosion, a massive surge in unsolicited commercial email that rose to become 80% or more of all email and had Internet service providers (ISP's) buying new servers once a fortnight just to maintain legitimate service. Combine that with the inability of the major email providers to agree on improvements to email protocols, and you have the death of transactional email that is still hampering large slices of our economy, like banking, healthcare, government, and retail. Are most consumers now aware that cybercrime is a serious problem? Yes. Can a young working mother buy diapers at a discount store without fear of losing her identity, and all the money in her back account, despite the billions that have been spent on cybersecurity? No, because we have grossly under-funded the vital work of catching the cyber-scum at the root of that fear. Are most companies now aware that cybercrime is a serious problem? Yes. Can a company develop new products without fear of them leaking from their computers to a nation state agency and/or its clients? No, because it is possible that every piece of hardware and software you buy to build your dreams has already been hacked, back-doored, or otherwise compromised, thanks in part to your own tax dollars at work (see this article or the pictures here if you are not clear on this). Now this next bit may sound self-serving, but I assure you it is not. I am employed by a company that sells security software, some of which requires root access in order to protect systems. However, the company doesn't pay me to sell this software, they pay me to think about security and privacy and explain of much of this stuff as I can to as many people as possible. The company has, in my considered opinion as a 20-year industry veteran, the very highest ethical standards. All of the people that I work with, in this company and in many of our leading competitors, are dedicated to eliminating the scourge of malware and other threats perpetrated by the world's cyber-scum. A fair number of us have been at this for 10 or 20 years or more. Yet today, in 2014, we are being asked: Are you helping the government spy on its people?" The answer is no, but although part of me feels hurt and even insulted by this line of questioning, objectively-speaking I cannot object, particularly when I see these pages from a catalog of hardware and software crippled by the NSA, in other words, produced by my own government. I am sure that the people who developed these things thought they were doing the right thing, and only intended them to be used for righteous purposes like defending our nation. But the people in charge clearly failed to consider what would happen to the nation when the world found out about them. I bet you a box of donuts that in 2014 at least one person will ask me where they can get a USB cable that is certified uncompromised. The fact that I don't have a good answer really bothers me. More people than ever before are going to be asking security professionals for help in creating secure systems, even as those professionals try to deal with NSA-fueled doubts about the very building blocks of such systems. One way or another, or both, it's going to be a BIG year. 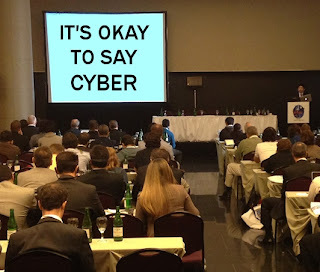 I predict, and sincerely hope, that in 2014 most of us information security professionals will stop apologizing whenever we use the letters c-y-b-e-r like in cyber crime, or cyber security. I also predict/hope we will stop putting "cyber" in ironic air quotes or pronouncing it in a snide tone that implies we are above using words that the world has thrust upon us. Let's face it, computers, networks, information systems, endpoints, digital devices, tablets, smartphones, Internet-enabled-DVD-players, Bluetooth insulin pumps, they are all cyber. So computer security, network security, information system security, endpoint security, digital device security, tablet security, smartphone security, Internet-enabled-DVD-player security, Bluetooth insulin pump security, they are all cyber security, or cyber-security, or cybersecurity. In 2014 we are going to have to answer a lot of questions about the security of digital information. In our answers we can call it digital security, or refer to "the security of all things digital", but it is also okay to say cyber security. And referring to the bad guys as cyber criminals is a lot easier than saying "those who would subvert any or all things digital with criminal intent." In 2013 there were times when I said things like cyber scammers and cyber scum well as cyber criminals. I'm not going to apologize for that because I think the general public gets what cyber means. It means all things digital, it means my data and the devices and systems that process and store them. Cyber security is about protecting that stuff. Let's save our erudition and expository powers for the many other, more complex and nuanced concepts that will need to be explained in 2014, like why public key encryption needs private keys, and what pseudo random number generators have done for us lately.